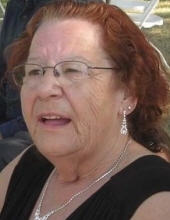 On Thursday, April 4, 2019, Marjorie Robarts of Sparwood, BC, passed away peacefully at the Crowsnest Pass Health Care Centre in Blairmore, Alberta, surrounded by her family & friends. She was 76 years of age. A “Celebration of Life” for the late Marjorie Florence Robarts, beloved wife of the late William Robarts, of Sparwood, BC, will be held at a later date. Left to mourn her passing are her children: Beth Ann Robarts, Cory (Wendy) Robarts, Jodie (Michael) Corbiel; Catie Robarts (Smith); Amber (Shane) Koinberg; Damion (Catrina) Robarts (Smith); & her many grandchildren, great granddaughter, and the two great grandchildren to come. Crowsnest Pass SPCA (Box 725, Blairmore, AB T0K 0E0). To email condolences to the family, please send to: www.snodgrassfuneraslhomes.com. To send flowers or a remembrance gift to the family of Marjorie Florence Robarts (Sparwood, BC), please visit our Tribute Store. "Email Address" would like to share the life celebration of Marjorie Florence Robarts (Sparwood, BC). Click on the "link" to go to share a favorite memory or leave a condolence message for the family.